Barrington Square is one of the most recent properties to be developed in Cameron Highlands, one of the top travel destinations in Malaysia. This brings about a new investment option for property buyers where Barrington Square is built at the Golden Hills in Cameron Highlands at the Brinchang town vicinity. Barrington Square is built on top of a leasehold land with a period of 99 years and is made up of three-blocks of shops and apartments. This project is the extension of the previously launched Somerset Square which was a huge success. In terms of units, the shop apartments are luxuriously built into 7-and-a-half storey structures where there are in total 381 apartments and 36 shops available. On one hand, the apartments have varying built-up areas ranging between 581 and 1,345 square feet respectively. The smallest unit are the studio units which start from RM301,800 while on the other end is the RM487,800 two to three room penthouses. In between that are the RM356,000 two-room units. On the other hand, the commercial lots are located at the ground floors of the 3 blocks. Built-up areas of the commercial blocks start from RM750,800 and with a built-up area of 1,001 square feet, it is among the lowest and most affordable shop lots around this part of Cameron Highlands currently. 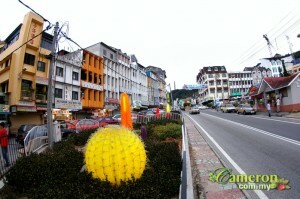 Golden Hill is one of the most ideal places to be in Cameron Highlands today where it is strategically located between Brinchang town and Tanah Rata, the 2 busiest towns here. At RM750k for a unit of the shop lot, it would be an excellent option for investment while the new motifs of the English-Tudor inspired architecture here would demonstrate a modern and contemporary lifestyle for the property owners. Apart from that, Barrington Square is very convenient as it is connected through the Simpang Pulau and Gua Musang main roads and not far from petrol stations, police station and nearby areas like Golden Hills Park and Lake Promenade. Apart from the shop apartments, Barrington Square pushes the element of modern design further with a roof top garden constructed on the top floor (seventh) of the blocks. Elevated at 5,000 feet above sea level, it would be an ideal place to enjoy the clean air with a bird’s eye view of the surroundings below. There is a garden here and a reflexology path as well.